Continuing our exploration of concert contests and how brands are engaging fans, we wanted to pass along info about Fuse and XFINITY coming together to give you a chance to win a full day and night of enjoyment in New York City! And a pair of tickets to enjoy a night on the town at any local New York City museum or attraction! 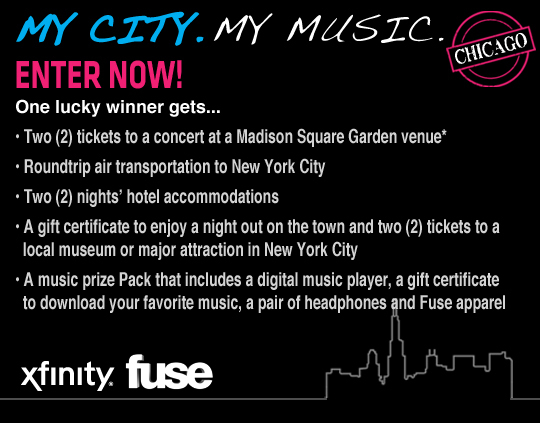 When chilling out at home I’ve enjoyed watching several of the live shows on Fuse, so it’s good to see them giving local Chicago fans a chance to win a trip to catch a show in the Big Apple. The contest also features Chicago band Kill Hannah but, unfortunately, this sweeps contest is limited to locals and is only open to residents of Illinois. The entry deadline is December 26th and you can enter by heading over to fusemycity.com to fill out the quick registration form! Stay tuned for more as the “My City. My Music.” contest unfolds and we talk with the winning fans and the contest sponsors on a future episode of Live Fix Radio.